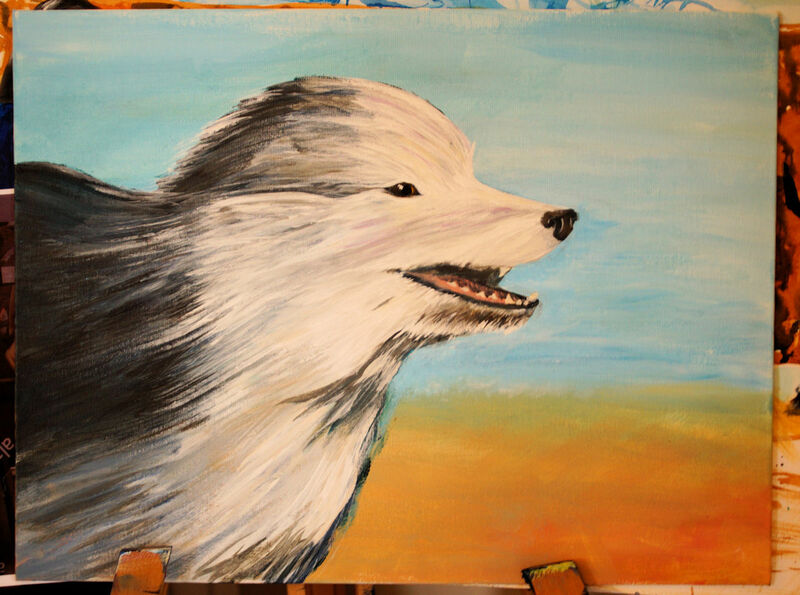 This week in art class: here is a painting of A Dogg. I'm not keen on it. It just seems a bit dull. Though I did learn something about painting eyes. it doesn't seem dull to me, i think it's quite animated. the colours are well distributed and balanced. the dog has credible form. is this a real dog, like your dog? or just imagined? She was a rescue dog I fostered some years ago while she was looking for a new home. It's not a bad likeness of her, I just feel that as an image it doesn't tell much of a story. to me it tells of the will of an individual and persistent force of life in us all, that dog is focused on something and free to pursue it, we all may see or experience something different from it, but that's what it does for me. beauty is in the eye of the beholder. good on you for fostering a rescue dog. i'm sure you got as much out of it as she did. I like the eyes too. Also, it is a nice, aerodynamic, go-faster looking Dogg. Not dull at all. It might even be flying. She is certainly speeding along, but I feel there should be more to look at somehow. I think you've floofed her well and her eye looks really animated. What might be throwing the viewer off a bit is the background, because she looks a bit as if she's flying, almost like Falkor/Fuchur in the Never-Ending Story. The photo she was taken from was of her running, but Colin the Art encouraged us to do a more closeup view rather than a full-figure, so we could concentrate on the texture of fur, and I think that meant the pose didnt' quite work.